Curling my fingers in the soft sand, I gaze far into the azure sea looking at the speed boat that is making its way to the coast. “I am so excited for my first scuba diving experience,” I turn around to tell my mom as she adjusts her apparatus. Stepping in the boat and quickly learning all the instructions, I prepare myself for some magnificent views. The boat stops at the diving spot and I jump in with my instructor, not the least bit nervous. As I see a swarm of fishes of all shapes, sizes and colours making their way through the blades of the gently swaying sea weed, I wonder just how fascinating it is to explore the underwater world, until I see a blue tattered plastic bag stuck between the aquatic plants. Disappointed, I come back up only to realise that soon, the world under water may not be very different from ours. 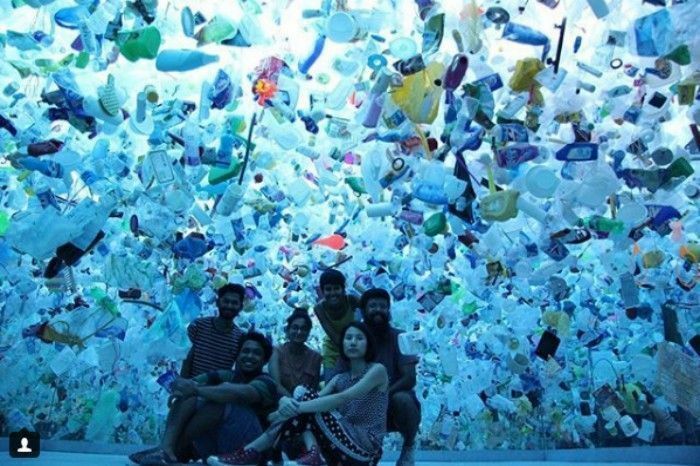 Just a few months later I rekindle the exact same feeling when I walk into the ‘Plastic Ocean’, an art installation on display at the Sassoon Docks Art Project, an initiative by St+Art India. Hundreds of plastic bottles and cartons hang low from the ceiling under a dim blue light. The walls have been replaced with mirrors and plastic is all one sees in the infinity room. Created by Tan Zi Xi from Singapore, this art project titled ‘Plastic Ocean’ aims to show people the viewpoint of a fish. In a book titled ‘Marine Debris: Sources, Impacts and Solutions’ the author writes that ‘Marine plastic pollution has impacted at least 267 species worldwide, including 86% of all sea turtle species, 44% of all seabird species and 43% of all marine mammal species. The impacts include fatalities as a result of ingestion, starvation, suffocation, infection, drowning, and entanglement.’ Given that plastic is economical, it is being consumed highly and being disposed off carelessly, thus creating a dead zone for many marine animals. Tan Zi Xi’s Plastic Ocean is aimed at spreading awareness about marine plastic pollution through art that cuts across demographics. She firmly believes that art speaks to audiences across languages and cultures. “When people encounter a visual piece like Plastic Ocean in an enclosed space, they are inevitably forced to think about it. Also, people are tired of reading and hearing about social and environmental issues, perhaps the impact of a physical encounter with a similar message will hit home,” she states. Project Plastic Ocean began 2 years ago and has been displayed at various exhibits in Singapore. The instillation at Sassoon Docks took almost 4 weeks to complete and involved processes like buying and washing plastics, system planning, working on lighting, meshes, mirror structure, floor grinding, stringing, editing, shifting, sorting, hanging etc. “The entire installation has made use of recycled plastics acquired from Dharavi, mostly daily used materials like soda bottles, food packaging etc to emphasize on our insatiable convenience culture that is completely thoughtless and unsustainable. The idea was to re purpose and give life to the discarded plastic,” Tan Zi Xi says. A few members of the local fishing community of Kolis, Banjaras and Hindu-Marathas to whom the Sassoon Docks project is dedicated were involved in the entire process as well. The artist makes us questions our own plastic consumption and shows us a bitter reflection of our own doings, through her instillation. Project Plastic Ocean is beautiful and heart-breaking at the same time. For more details about Tan Zi Xi’s art work, visit her Instagram page here. You can check out her website here. The Sassoon Docks Project is open from Thursday to Sunday between 12 p.m and 10 p.m.
To know more about the St+Art India’s Sassoon Docks Art Project, click here. For more details about curated tours at The Sassoon Docks, click here.